Vi her på rootsy.nu vet at Chip Taylor (»Wild Thing« etc.) er en annerledes artist, og like viktig, et annerledes menneske, med samvittigheten i god behold. På tross av flere tiår i både gambling og musikkbransjen. Men det spørs om ikke Chip har overgått seg selv med det nye prosjektet Rock n´Roll Joe, et nettsted som tar mål av seg til å gi oppmerksomhet til alle gode/ viktige bidragsytere til rock-historien som har kommet i skyggen av våre keithricharder. For å kickstarte prosjektet slipper Chip plata »Rock and Roll Joe: A Tribute to the Unsung Heroes of Rock n´Roll« (Train Wreck Records), sammen med gitaristen John Platania og fiolinisten Kendel Carson. Gnisten som tente prosjektet falt når Chip & band turnerte Skandinavia i 2007, der de bl.a. spilte Down on the Farm. 22. & 23. juli er Chip tilbake på Down on the Farm. Rock and Roll Joe is a project dedicated to promoting the unsung heroes of rock music - the people who were, and still are, critical to the spirit and passion of rock and roll and yet never have received the credit they deserve. 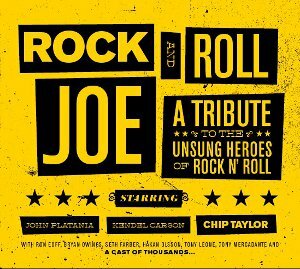 The idea for Rock and Roll Joe began during Chip Taylor's Scandinavian tour of 2007. As Chip traveled through Norway and Sweden with his longtime friend and guitarist John Platania, new protégé fiddler Kendel Carson, drummer Bryan Owings and bass player Ron Eoff, they talked about everything. But many of the conversations revolved around the musicians that we knew and respected and Chip realized that most music fans didn't really know the people who were behind many of the great records of the last 60 years. That song prompted several more, with everyone in the band suggesting more Rock and Roll Joes in need of the spotlight. At the end of the tour back in London, the band promptly recorded the new songs and the Rock and Roll Joe album was born. The album is just the beginning of the Rock and Roll Joe project. After the release of the CD, Chip Taylor and Train Wreck Records are launching a web site that will promote and honor the unsung heroes of rock music. The history of rock is filled with people such as Hank Garland and Mickey Baker who were instrumental in shaping the sound of today s best music. Yet their contributions are barely recognized. In addition to the underappreciated musicians and session players, there will also be some room to highlight the songwriters, producers and behind the scenes people who helped shape the music we love. And Rock and Roll Joes aren't only those musicians who helped make our favorite records - they are also those who performed the great records we never got to hear. Some in the business were the victims of bad luck. Others were our friends and family members who simply loved to play - at home or in the local bar - and introduced us to a lifetime of great music. The Rock and Roll Joe web site will seek to redress this injustice while also being a place where music lovers can have fun learning about and discussing the present and history of rock and listening to great music. Chip has been busy soliciting entries from his fellow artists and friends in the music business to help get the ball rolling. A portion of the profits from Rock and Roll Joe will be donated to musicians in need.